Ai Campionati Italiani su Pista in programma nel velodromo di Montichiari (BS), Marco Coledan si è laureato Campione Italiano nell’Inseguimento Individuale con il tempo di 4:26:522. In finale il passista del #Greenteam ha avuto la meglio su Elia Viviani (Cannondale) che si è fermato a 4:32:932 e Paolo Simion (Zalf), 4:35:010. Per Coledan si tratta di una conferma in quanto già lo scorso anno aveva vinto lo stesso titolo tricolore. 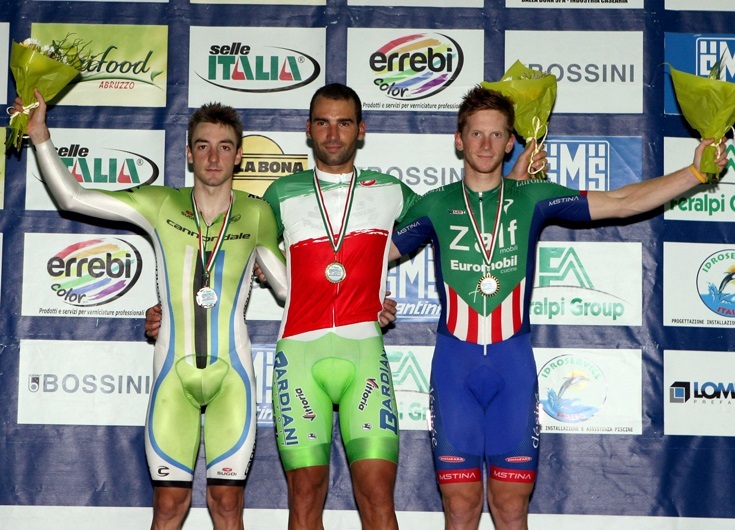 At Track Italian Championships in Montichiari velodrome, Marco Coledan has conquered the Italian Champion jersey in the individual pursuit race with the time of 4:26:522. In the final #Greenteam rouleur beat Elia Viviani (Cannondale) who ended with the time of 4:32:932 and Paolo Simion (Zalf), 4:35:010. For Coledan is a confirmation because he won the same title already last year. Marco Coledan:”I’m very happy of this jersey. This year I did less track activity than last seasons, but after the end of road calendar I decided with the team to do something. So I took part at Track European Championships last week where I helped Viviani to win the point race and now at Italian Championships my goals was to confirm the leadership in the individual pursuit and then try to win other jerseys”.